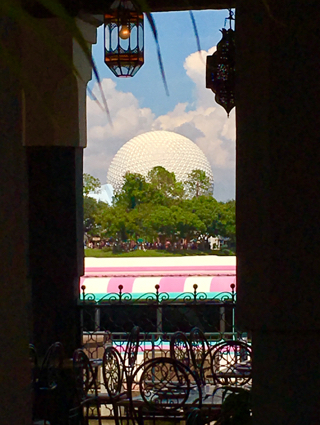 Spaceship Earth is a world famous theme park icon, and I'm always looking for an interesting angle for a photo. Today, I saw this view while walking by Morocco in World Showcase. This shot was taken thru the outside seating area of Spice Road Table and across the lagoon. You can also see a "Friendship" boat in the foreground.